All of your foundational director knowledge in one comprehensive, affordable and flexible online course. ⊕ Monthly live group learning / coaching calls with Lisa (using Zoom - an online video conferencing tool): held on the third Wednesday of each month at 6.30pm AEST. ⊕ A Certificate of Board Readiness – upon completion of the end-of-course quiz (80% pass mark). ⊕ Weekly emails keeping you on track with your learning and course work. This 12-week intensive course is for new and aspiring company directors and board members; accelerating your learning and understanding of what it takes to be on a board. You will gain all of your foundational knowledge in one course that is widely accessible to those looking to enhance their boardroom potential. Learn at your own pace and become a more knowledgable board member as you gain knowledge from some the best subject matter experts from around Australia. All of the contributors have board experience, and many have been formally recognised for their business and professional achievements. You can view their profiles here. Have your personal questions answered by an experienced company director who is available as your course supervisor. They will be active on the course forum, and will run a three webinars with the rest of your course classmates during the course. The class will learn together with weekly emails keeping you on track and up-to-date with the course material. The time investment required will be around 4 – 6 hours per week. You can stand out from the board competition by gaining your Certificate of Board Readiness by successfully completing the end-of-course multiple choice exam. All participants will receive a Summary of Topics Completed, including the estimated number of hours you have invested into the course, to demonstrate your investment into your continued professional development. Still wondering "What's in it for me?" Here is an overview of the value you will receive beyond the boardroom from completing the Boardroom Bootcamp course. 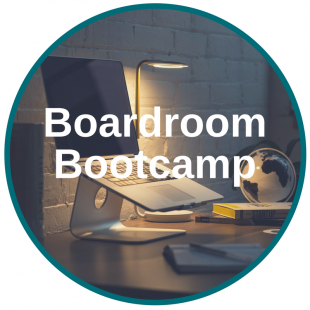 Boardroom Bootcamp is a co-ed course designed specifically for new and aspiring company directors and board members from a variety of backgrounds and from all types of boards (for-profit, not-for-profit, family business, etc.). If you are looking to join a board in the near future or have been on a board for 3-5 years, this course will help you understand your role, duties, and responsibilities as a company director. There are no restrictions to who can enroll for our e-courses. As mentioned, our courses are best suited to new and aspiring company directors and board members. If you have any further questions, please refer to our course frequently asked questions (FAQs) or send us a message using the enquiry form below.